Cities are clearing the way for transit by taking control of their curbs. Urban curbsides, including parking and loading regulations, have conventionally been based on the immediately adjoining building: meters in front of shops, loading zones near supermarkets, no-parking areas at warehouses, unmetered parking in residential areas. But this practice assumes cars are the primary mode of transportation on a street, leaving cities to choose between local uses and mobility—because through-moving cars do little to support, and much to harm, local business and residents. Now, cities across North America are recognizing the value of their curbsides as ﬂexible zones. To make corridor-level changes possible, leading cities are adopting and acting on policies that prioritize reliable transit and safe bicycling infrastructure first, followed by other important uses of the curb like deliveries, passenger pick-ups, green stormwater infrastructure, and small public spaces—as well as managed parking. This policy foundation supports transit project managers and designers in making better decisions about curbside uses, and sets a clear expectation that transit is a priority in street design. This paper provides examples of how cities have successfully changed curb use to support transit. It is focused on the types of busy, store-lined streets where high-ridership transit lines often struggle with reliability. 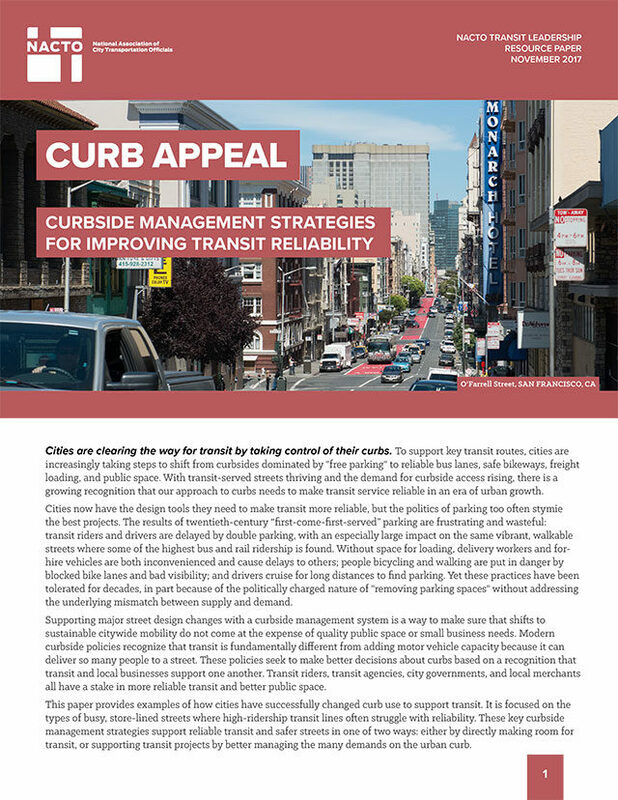 These key curbside management strategies support reliable transit and safer streets in one of two ways: either by directly making room for transit, or supporting transit projects by better managing the many demands on the urban curb. This paper was made possible thanks to a grant from TransitCenter.